"Yer eyes'll shine when ye see the rivers runnin' silver in Mithril Hall!" Bruenor the dwarf, Wulfgar the barbarian, Regis the halfling, and Drizzt the dark elf fight monsters and magic on their way to Mithril Hall, centuries-old birthplace of Bruenor and his dwarven ancestors. Faced with racism, Drizzt contemplates returning to the lightless underworld city andmurderous lifestyle he abandoned. Wulfgar begins to overcome his tribe's aversion for magic. And Regis runs from a deadly assassin, who, allied with evil wizards, is bent on the companions' destruction. All of Bruenor's dreams, and the survival of his party, hinge upon the actions of one brave young woman. 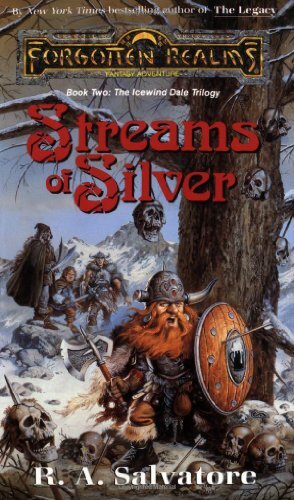 Streams of Silver is R.A. Salvatore's second book in the Icewind Dale Trilogy, based on the Forgotten Realms fantasy setting.